Looking through the fragments I saw colours and shapes; suddenly I recognised a picture of Las Vegas itself, first a distant nighttime shot with the mountains rising behind the lights, then the flanks of the casinos, sliced into narrow rectangles by her knife or scissors. “Has she been here before?” I said to my companion. “Are these her own photos?” There was no proof they were hers. I could invent a narrative by assuming that they were (she visits Las Vegas, she meets someone, they invite her to make work for an exhibition; “All right,” she replies, returning to New York), but I was aware that the narrative was in my imagination. I was trying to solve a mystery: what was this artwork from Brooklyn doing here, when Yaniv had never exhibited in the city before, as far as I could discover? She didn’t even show on this side of the country. The answer must have been straightforward. All I had to do was find the right person to ask. Email the artist, you say. The spots on some of her cloth scraps reminded me of the red polka dots I had seen on Robert Rauschenberg’s ¼ Mile last time I was in Los Angeles. The red dots are evenly spaced, a sort of joke from Rauschenberg who evenly spaced nothing, though even spacing must have appealed to him because he used polka-dotted cloth in his earlier Combines as well. And even without symmetrical dot-gaps, his objects maintain their dottish individuality. This thing in a 1963 Untitled is obviously a photograph of John F. Kennedy, and this other thing in a 1954 Untitled needs to be so unmistakably a chicken that it has its own staging box where it can show itself off. (What does anybody besides Rauschenberg actually do with a stuffed chicken?) Hannah Hoch, making her photomontages a century ago, tilted the cut-outs to suggest chaos, nonetheless her fragments preserve themselves as an eye, a wheel, a horse, and so on. Yaniv, on the other hand, likes to confound her things together, preventing you from identifying pictures until you’re quite close to them, toying with the idea of a formless form, or a form that has to be individually generated by the seeking motion of the person in the room, though there is the larger, spaceship form that anyone can see from ten feet away, so maybe not. Still, you are struck by the idea that there was once a public habit of larger clarity. Now that style of clarity has changed, there is an acceptance of pixels, we are no longer astonished by molecules. The larger shapes themselves are island-like as well as machine-like, somehow biological, a coral growth. The glue makes the cut-ups buckle as if the starship has been in a war, but they hold together and billow off the walls, roped back with black nails. Coming closer to some of the photos you see tiny, familiar holes, as if these inset pictures were once upon a time tacked up in the artist’s studio with something thinner than the nails: maybe a set of pushpins. Look here, those little pushpin holes are multiplied in one of the corners that is no longer a corner. Maybe the originals were repinned a number of times on different parts of that room in New York. 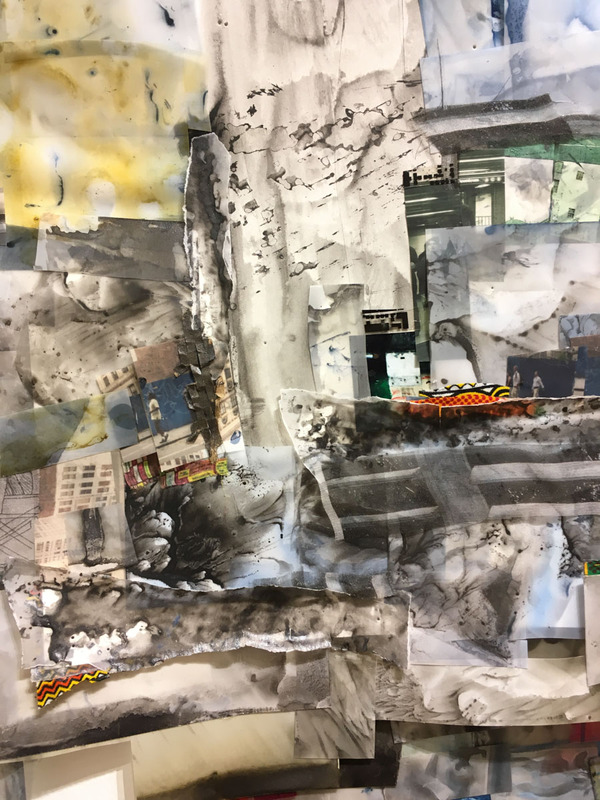 Here is another narrative, the artist in her studio, sticking a pin through the corner fragment we can see in front of us, looking at the whole picture for days or even months, taking it down, making a decision, then slicing it up. It is a real thing. On the Horizon is at the Charleston Heights Arts Center at 800 Brush Street, Las Vegas, NV 89107 through January 5, 2019. Visit their website for gallery hours. Etty Yaniv works on her art, art writing and curatorial projects in Brooklyn. She holds BA in Psychology and English Literature from Tel Aviv University, BFA from Parsons School of Design, and MFA from SUNY Purchase. 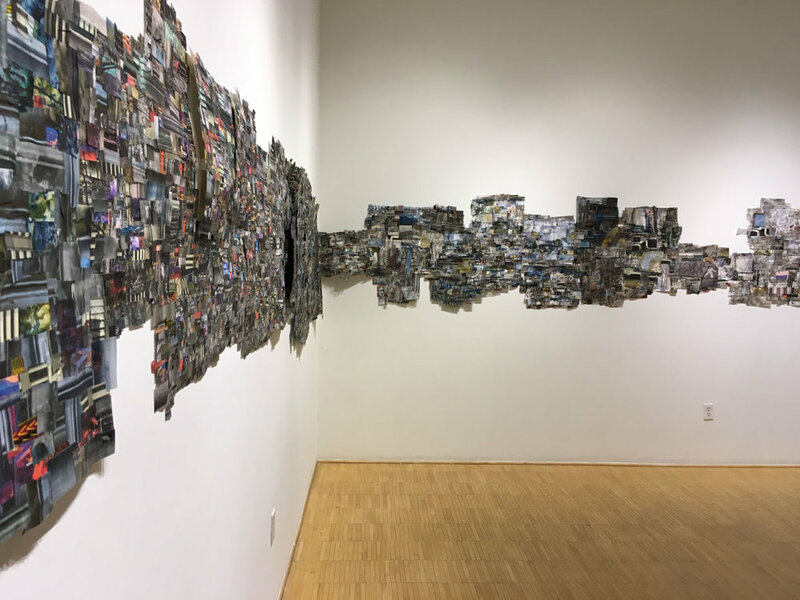 In her installation work She is integrating mediums such as drawing, photography and painting to form three dimensional immersive environments. She publishes the blog ART SPIEL. All images courtesy D.K. Sole.